I've worked on a lot of boats during my tv career and I have to say, I'm never that big a fan. I love the water but I hate rocking back and forth far from shore, feeling sick and wondering when I'm going to get off. But- that's me. I have a bunch of guy friends that love to spend time at sea, which is why I'll be emailing them this blog post today. Ian Nigh of Greenville, South Carolina started making anchor bracelets bent out of 6 gauge copper wire and slowly evolved his line into finished pieces like this Flemish (or figure eight) loop. Ian, "Knots like these are invaluable to workers on wharfs throughout the world as they dock ships for loading and unloading cargo." The Captain's Link bracelet quickly caught my eye. Ian, "In boating, this knot is known as the 'Duncan Loop' and is used to join almost anything to a line while retaining almost the full breaking strength of the line." The highest quality bolo is used to create this Dreadnought bracelet, which I love too. With such quality, original work, Ian's shop, Maritime Supply Co. is growing an impressive following. Ian, "A lot of the brand inspiration comes from and was created by Greenville local, Zach Landrum. He designed our Maritime Anchors and the Maritime Supply Co logo." This is quite the handsome bracelet for any boat guy. The Maritime Anchor is hand crafted and is one size fits all. 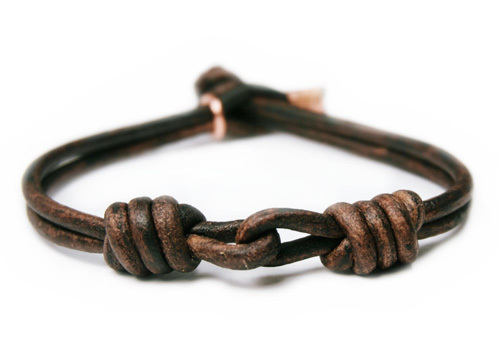 The anchor comes in a silver or copper casting which is paired with an antique brown hand-treated leather cord.